When I was transferring rooms I found a bag of leftovers from my brothers shirts that I had previously made a guilt for my Aunt. I figured it was time to make something for my New Studio that I could look upon and remember Marc my little brother. I can tell that I’m healing as I was not emotional like when I made the quilt for Aunty Nicole. This is the bear that I was able to finish this afternoon. A few hiccups along the way nothing that my seam ripper could not fix. I added the tie if i can find a black leather clip on then will be replacing it.. I can remember Marc wearing that tie when he was a teenager. The buttons came from the button container that I inherited we would play with and spend hours sorting when we were little. 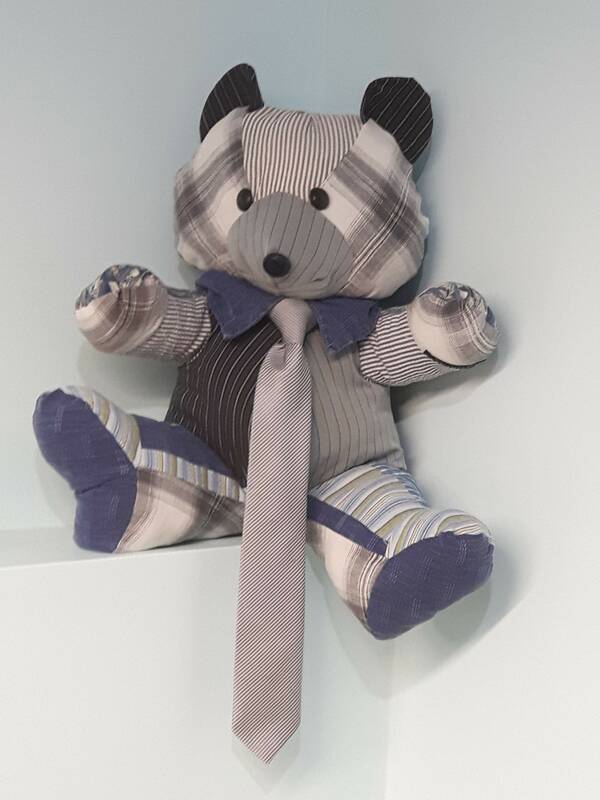 This bear has found a permanent home on the shelf in my studio.